I’ve cycled along many a canal towpath, and they have provided me with traffic free routes both into and out of numerous cities and historic towns. Canals are easier to track on a map and unlike rivers which tend to aimlessly meander until they reach the sea, canals were built for a purpose, and they can take you into and away from places often without you having to endure the hassle of other traffic. 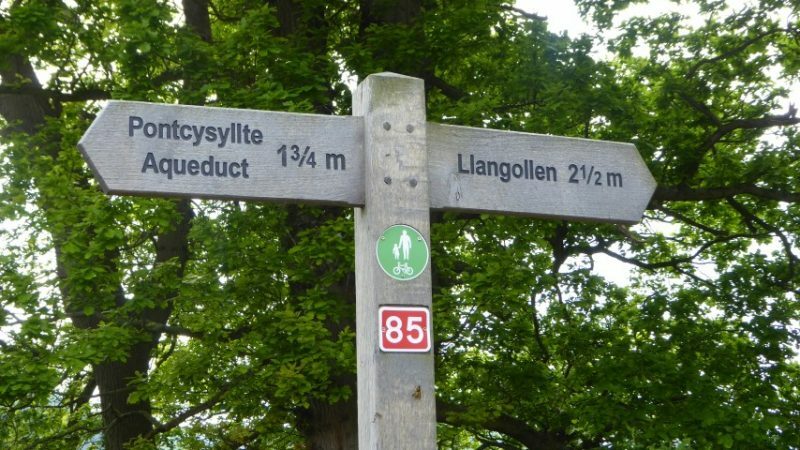 Two British Cycle Quest (BCQ) locations in North East Wales are in the Vale of Llangollen and are also only ten miles apart. To get to them, I let Britain’s industrial heritage help me. Firstly by letting the ‘train take the strain’ I travelled from Chester to Chirk. 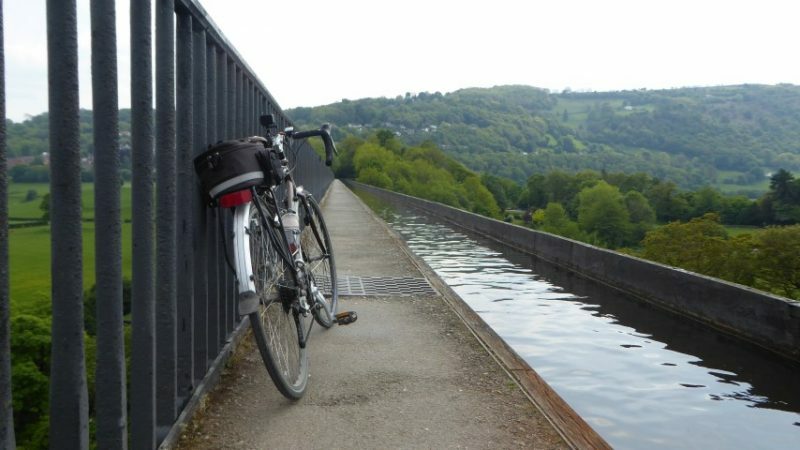 Then I cycled along the Llangollen canal towpath that took me into the heart of the Vale of Llangollen. 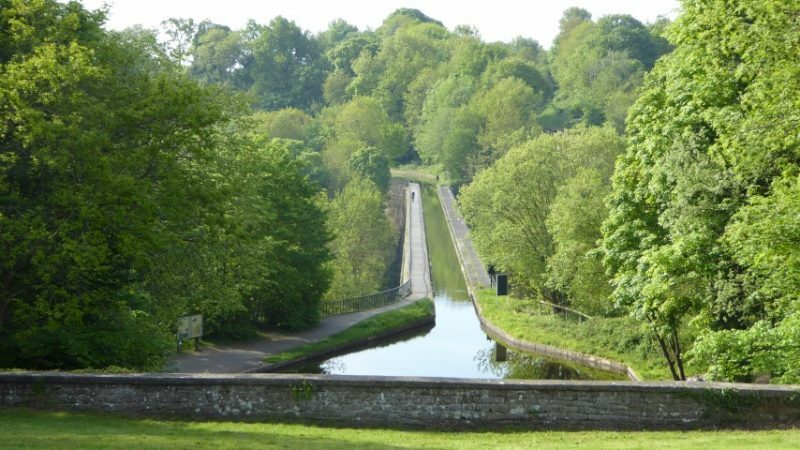 Britain has 2,200 miles of man-made canals and this stretch of the Llangollen canal stakes a claim at being perhaps the most picturesque of them all. Between the Welsh border town of Chirk, where the River Ceiriog marks the boundary between England and Wales, and Llangollen; the canal includes some terrific feats of 19th century engineering. These include two aqueducts and two notable tunnels. Together these are so important, that the 11 mile stretch from the Chirk aqueduct to the Horseshoe Falls beyond Llangollen make up one of the UK’s, UNESCO World Heritage sites. Chirk Aqueduct taken from above the tunnel entrance. Whilst crossing the Chirk and the Pontcysyllte aqueducts with their spectacular views is a delightful experience, I have to say that the tunnels could be a little daunting for some, unless you have a torch to light your way, which I didn’t. Both tunnels have a decent path and a sturdy rail that runs between you and the canal. The Chirk tunnel is the longer of the two at 420 metres in length. This can be quite dark and whilst walking my bike through that tunnel I could hear unseen water running down some parts of the walls, however none of this fell on me. The second tunnel known as the Whitehouse tunnel is 175 meters long and fortunately, there was no sound of any running water. Beyond and between the tunnels, a lot of the canal passes through deciduous woodland and the sunlight pours through the fresh green leaves creating dappled sunlit patterns on the path and the canal before me. 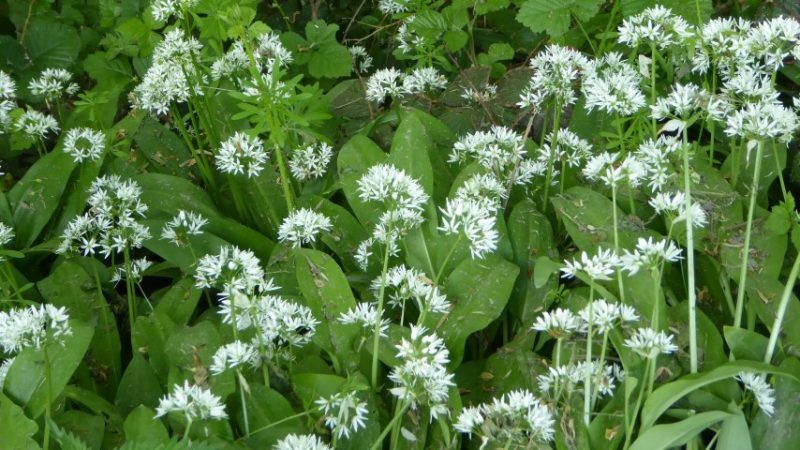 I can smell also the subtle scent of garlic and there are sizeable swathes of ramsons or wild garlic which were currently in bloom and have colonised much of the woodland floor alongside the canal. It’s a ten mile stretch of towpath from Chirk to Llangollen and I can take it easy. A steady eight miles per hour is sufficient to enjoy the scenery and beauty of this wonderful countryside. There is a lot to enjoy and I stop to watch a mother Mandarin duck with her seven chicks. A mile or so further on a bold grey heron seems prepared to stand its ground as I approach. I fear that the heron would be a danger to the young mandarin ducks which are quite a rare species in the UK. I follow the canal to Llangollen, and here there is a short length of my journey where the canal, the road, the railway and the River Dee all run alongside each other. After the Chainbridge hotel I continue along the towpath until I come to the Horseshoe Falls. This is the end of the canal, or perhaps more accurately the beginning of it, because it is here that there is a sluice gate that takes water from the river to feed the canal. From the Horseshoe Falls I then followed the quiet road north of the Dee heading west to the village of Carrog where I am in search of the name of the local Inn so that I can answer the first of my BCQ questions. Along this road I was able to appreciate the difference between cycling alongside a canal compared with cycling alongside the river. Although some stretches of this road run alongside the River Dee, within a relatively short length of road I am high up and contemplating the valley and the river from a much more elevated position. The downside of cycling for spectacular views is that you have to work for them. It’s May, and the trees have a beautiful fresh green about them and much of the hillsides are still covered in blue bells. In the woods above the village of Carrog I hear the distinctive yaffle call of a Green Woodpecker, a bird that I regularly hear but for which a clear sighting has eluded me for some years now. At Carrog, I note the name of the Inn, take my photos and then turn around to retrace my route. This time it seems easier, the uphill parts are less steep and there seems to be more downhill coasting than uphill struggling. At Llangollen I head north for my second BCQ question and search out Eliseg’s pillar which I find just beyond Valle Crucis Abbey on the road heading up towards the Horseshoe Pass. From there it’s a nice downhill freewheel until I meet up with the Llangollen canal again that will return me to Chirk. Ten miles on and I leave the towpath just before I enter the longer of the Chirk tunnels to discover that it comes out right by the station. It was a good days cycling with both the canal towpath and the hills around Carrog providing me with some spectacular views. I also answered two more questions for British Cycle Quest.